Popular manager Federico Hurtado will be very pleased with the progress made in his fourth season in charge of Torquay United. In the previous post we discussed the improvement Hurtado needed to make in the transfer market. Before we look into how Torquay performed in the 2042/43 season, let’s see if Hurtado has improved the quality of his signings. Though the improvement is not hugely significant, what is important to note is that all three of the top signings in 42/43 were signed on permanent deals. In addition, both Malone and Turner were signed in December and therefore missed a large portion of the season. Torquay United finished in 13th position, just 1 place higher and seven points better off than the previous season. Yet the improvement shown towards the latter stage of the league has given both Hurtado and the team confidence moving forward. Mentioned in previous posts, being able to compete in the Cup competitions are vital, especially considering our financial position. This season Torquay made it all the way to the 3rd round of the English FA Cup. After progressing through the 4th qualifying round, Torquay faced (and beat) both Sutton United and North Ferriby to reach the 3rd round of the FA Cup. A 1-0 defeat to League One side Southend ended our run in the Cup, but financially our club benefitted hugely from the run. Experimenting with three at the back – the reason behind our improvement? Federico Hurtado opted for a change of system at the beginning of the season after noticing that his full-backs were consistently achieving poor match ratings. Despite many attempts at improving the way they played, the decision was made to try a three at the back system. This system was persisted with until late-February, where a run of inconsistent results lead Hurtado back to his tried and tested 4-4-2. 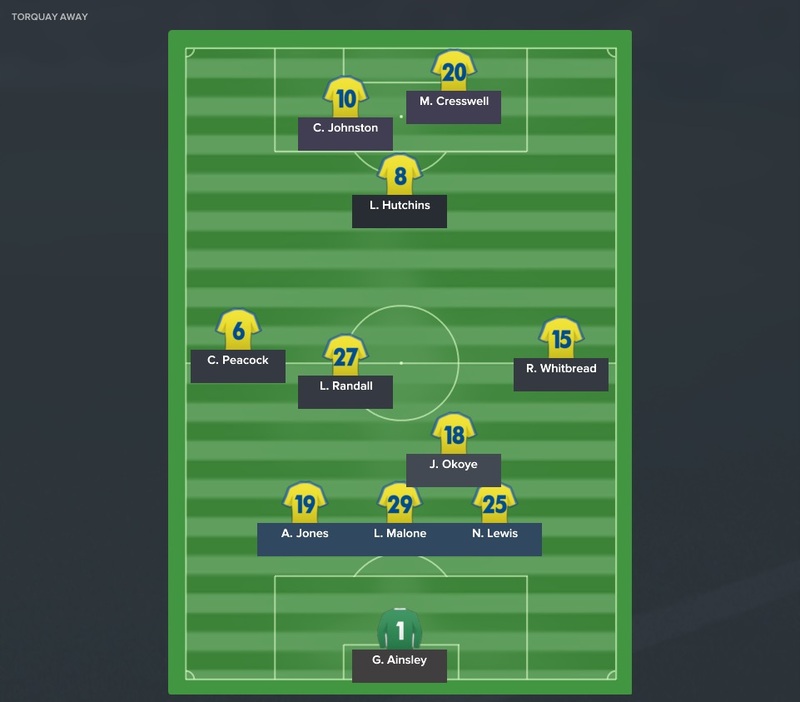 A tweak to the standard 4-4-2 saw Federico push his wingers further up the field, allowing them to be closer to the opposition goal by the time that Torquay would counter. This proved effective and completely turned around Torquay’s form. 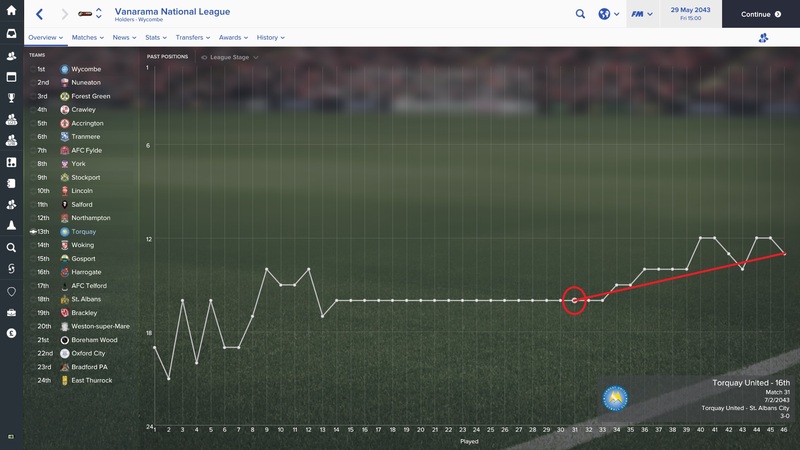 Torquay only moved up three places with the change, but the way in which they went about their matches was impressive and displays some very good signs for the future. Federico Hurtado will be serious about pushing for promotion next year. After two years building his side in the Conference, League Two is just one good year away and the thought is an exciting one for Hurtado and all Torquay fans alike. If the side perform next season how they finished this one, anything is possible. Thanks for reading our sixth instalment of VivaTorquay. Please do follow the blog for more Football Manager content and be sure to check out our social media through the links above.